With DoorDash Drive, restaurants can use DoorDash to request a Dasher to deliver orders to their customers directly. These orders may be regular-sized orders or larger catering orders. For catering orders, restaurants may request that the Dasher unpack and lay out the trays for the customer upon delivery. These restaurants typically require multiple hot bags to best complete the delivery. Certain non-catering fulfillment orders will be paid under the standard Dasher Pay Model. More information about the standard Dasher Pay Model is available here. Scheduled orders provide you the option to claim Drive delivery opportunities early, oftentimes the day before or the morning of the delivery. Restaurants require that you must be equipped with 2 large insulated bags to claim Drive orders in advance. Once you are equipped, you will be able to view scheduled orders. In order to ensure the highest chance of getting to take these large orders, we recommend claiming the orders as soon as they’re available. If you already have a Dash set when claiming a scheduled delivery, claiming a Drive delivery will simply extend your Dash. If you do not have a Dash set, claiming a delivery opportunity will create a new Dash for you to complete the claimed order. You must sign into to your Dash 15 minutes before pickup time to indicate that you will still be completing the delivery. If you do not sign in, that order may be reassigned. If you claim an order but can not complete it on the day of the delivery, the order must be unassigned at least 2 hours before pickup time. For pre-claimed Drive deliveries, you can sign in anywhere - no need to be within the starting point area to get your Dash started. Once you claim a Drive order, a Dash will be created for you. you’ll go to the restaurant as usual. However, you’ll notice there is less detail about what you’ll be picking up. The restaurant will know what to give you. Pro tip: don’t arrive too early to pick up the order. Merchants don’t always have space for Dashers to wait while they finish preparing the order. Keep in mind that the customer placed the order with the restaurant, not on DoorDash. It will be easiest (and accurate) to communicate you’re delivering the order on behalf of the restaurant. If the customer is unreachable, the most efficient approach is to attempt to find an administrator at the business first, then contact the merchant, and if both of those parties are unreachable, chat with DoorDash support. Some customers may ask you to do some light set up. Generally merchants ask that you not deliver too early. These customers are typically business clients and have communicated that being more than 20 minutes early is a problem with planned lunch schedules. ONCE YOU HAVE TWO LARGE INSULATED BAGS, YOU WILL BE ABLE TO CLAIM SCHEDULED ORDERS IN ADVANCE. A guaranteed minimum is displayed upfront for every Drive order. Dashers will earn base pay + 100% of tips received by DoorDash from the merchant or the customer. If the base pay + tip is less than the guaranteed minimum offered, Dashers will receive the guaranteed minimum amount. If the base pay + tip is greater than the guaranteed minimum, Dashers will receive base pay + tip. If the suggested route crosses a toll boundary, you may receive additional earnings. Note that the amount of this additional earning is determined by market and is based on average toll rates; it is not specifically tied to the toll that you pay on a given delivery. The estimated fare will be automatically added to the base pay for eligible deliveries. Q: Who requests DoorDash Drive orders? 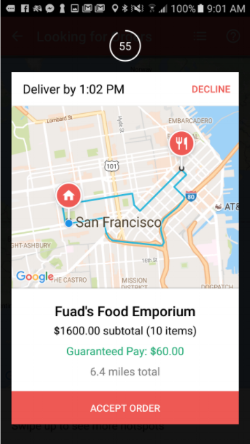 A: Merchants request DoorDash Drive orders. Q: My customer wasn't aware of DoorDash upon delivery. Is that possible? A: It is possible. The customer placed the order directly with the merchant so he or she may not be familiar with DoorDash. Q: On DoorDash Drive orders, is any additional set-up be required when you drop off the food to the customer? A: Most Drive orders are catering orders so customers will request that Dashers unpack the trays and lay them out for the customer when dropping off. Q: On DoorDash Drive orders, who can you reach out to if you have questions? A: For DoorDash Drive orders, Dashers can reach out to both the merchant and the customer through the Dasher app.